In a fleeting moment of insanity, I agreed to take on the task of making 90+ cookies this weekend for a cookie exchange. Do I generally eat loads of cookies? No. Do I have use for 90 cookies? No. Did I commit to making an obscene amount of baked goods? But of course. I settled on a drop cookie with hopes of making the process as simple as possible (don't even think I would consider making something like cream wafers for the lot). 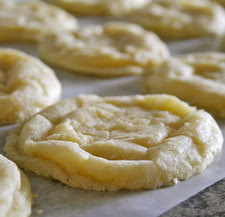 This particular recipe, the Lemon Crinkle Cookie, was award-winning, so I didn't hesitate for a minute in choosing it. Admittedly, I am not much of a fan of chocolate. And since each and every other holiday cookie is bathed in chocolate, I decided to shake things up a bit and go with a citrus cookie. An extra perk was also the fresh scent that lingered in my kitchen while baking them. It was completely nostalgic and reminded me of times of yesteryear where I would bake molasses cookies with my grandma (however, she never cared to use measuring cups those times). Four batches later, I had the finished product.﻿ The perfect combination of citrus and sweet with a melt-in-your-mouth chewy texture. Enough cookies to give out with leftovers to freeze for Christmas day. Next up: Christmas dinner.